We woke this morning to find the temperatures once again hovering at the freezing mark both inside and outside. However the inside has warmed up much faster than the outside as the sun doesn't seem to be in evidence anywhere in the sky. I'm sure it is there but with all the cloud cover I doubt we'll see it today. The little town of De Graff creamery/eatery which apparently delivers to your door as well. I don't think we'll be going ahead with our plans which was to find Possom Hollow Trail and perhaps take a hike but we both agreed only if the sun was out and warming things up. No sun, no hike, so it appears this will be a do nothing kind of day again. Those blue skies made things feel much better yesterday. The sun finally came out around noon but kept playing peek-a-boo with us for the rest of the day. The wind also picked up and as long as we stayed down here in the valley at the river we were good, but you could hear the wind whistling around on top of the hill. We opted to stay put today even though the sun came out off and on. A walk across the grass found the squish, squish of water even though one couldn't see it. These pictures are before and after. The first is the day after we arrived here. See all of the debris and crap there and look how high the water is, you can't see the dock boards at all. 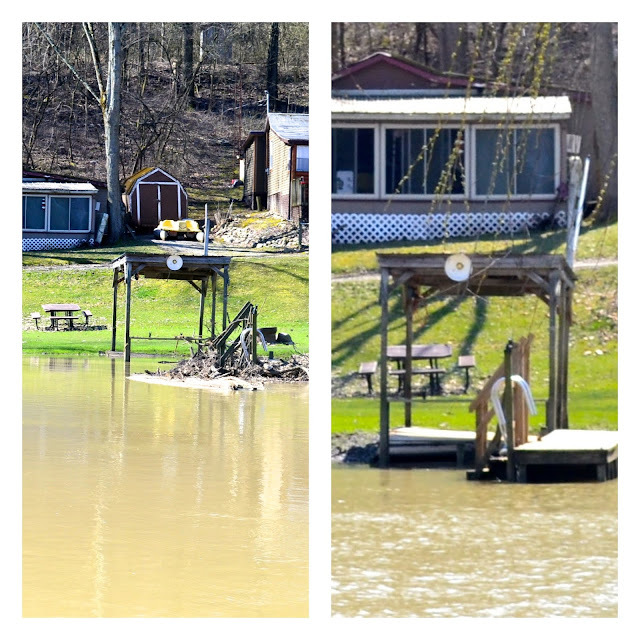 In the second picture you can see they've cleaned it up and today they pressure washed the entire dock off. The water is still slowly receding. The sounds of building are continuing down in our little hollow but across the river. Someone is building or doing some remodeling. We can see the frame work from here but it's hard to tell what they are doing. The thump, thump, thump of a hammer is like white noise in the background for the most part but also a reassuring sign of hope that spring will soon be here. For the most part we've been staying inside due to cold but today the temperature reached 60F/15C but the wind that managed to come down into the hollow kept it from feeling that warm. Not a lot of wind, just enough to say nope, not spring yet. A few hours with the door open allowed us to air out the Igloo which has been closed up for quite some time. HRH Miss Kitty enjoyed the open door as well. She sat and watched outside for an hour or so before tiring of the squirrels and birds. Looking across the river. The water has receded quite a bit but still has a bit more to go. We've been watching the weather report for the upcoming weekend which will be a travel weekend for us. The weather reports are calling for some pretty ugly stuff in the GTA (Greater Toronto Area) with possible freezing rain and accumulations of the same. So we're going to keep things in mind when we start out. Everything looks good until at least Brantford, Ontario. That seems to be where the line for the freezing rain may touch. So we'll head out Saturday even in the rain as I would like to cross even though we have another day before our insurance runs out. We then have the option of getting off for an overnight before the border if necessary with a quick run Sunday morning or we can continue and at least get into the Windsor area where they expect only rain. An overnight at the Husky truck stop is an option there. Further on it looks as if London will miss the freezing rain event and London/Tilbury/Dutton is our ORIGINAL destination for Saturday night anyway. I believe the river is still a bit high but coming down. From London our plans are to head to Hamilton on Sunday. However if there is an issue with the weather we shall sit tight and wait until Monday before heading that direction. I have an early morning Rheumatologist appointment on Tuesday in Hamilton and we both have a dentist appointment on Thursday late morning. Everything hinges on the exact temperature over the weekend. A couple of degrees higher would mean just a steady cold rain, a couple of degrees lower could mean a serious ice event for the area from Brantford and all points further north along the 401 corridor. It looks as if the north end of Toronto and the city of Barrie will be hardest hit. It also could impact the Golden Horseshoe along Lake Ontario from Hamilton to Niagara Falls if the temperature drops a degree or two. So we shall just have to wait and see. However I feel confident we'll get to Windsor without any issues. The cabin directly across the Miami River from us. With so much mud the water is brown and seems to be having a hard time figuring out which direction it's supposed to flow. On our arrival it was flowing east to west, yesterday and today one side is flowing east, and the other side is flowing west. The middle seems to be a mix of currents, swirls and eddys. Everywhere one hears about the weather, according to the powers that predict the weather and keep the records, the temperatures are about 10 degrees below the seasonal norms and will remain so for the rest of the month of April. With another cold spell coming next week. They say it won't return to normal or above normal until INTO May. So we may be cold for while longer. For the Canadians out there, S. Ontario had 2 days in the double digits in January, 5 in February, and 1 in March. Since March 18 there hasn't been a single double digit day. For our American friends, we use the metric system in Canada so double digits would be 10C which would equate to 50F. As Southern Ontario is tempered by the Great Lakes it gets some warmer temps through the winter months as well. Nothing too balmy but warmer than the rest of the province. When we arrived the water was making those decks on the right side of the pictures hang on for dear life instead of floating away. These river side sites are all empty and their units stored elsewhere so they aren't affected by the spring floods. You can see the fresh gravel waiting to be spread. So there you have it, a much nicer day but windy up the hill which forced us to stay home and not go for a hike. Tomorrow is supposed to be nicer still with temps reaching into the mid 60's/ 18C but I have a few chores I want to do outside instead of going out exploring. The closer we get to home the less we feel the urge to get out and do things. Thanks for stopping by, I hope you enjoyed your visit. Feel free to drop a comment. I appreciate them all. You can see the edge of the deck that has been pushed by the high flood waters. The grass is starting to green up but it's very squishy under foot. We are sitting high and dry on gravel. There is another Chevy like ours sitting on the other side of us, been there a few days now. As you can see it was nice enough to have the door open for a while. That is ally can do, watch the weather and play it by ear. Hopefully things work our for the better, travel when you can and stay still when necessary. Safe travels and hope things work out in you favour. Thanks George. It's the only way I travel, I don't take chances, I'm a chicken. Stay warm, hope you folks miss all the weather. Keeping an eye on the forecast for the few days ahead is important. Don't dwell on it, just follow your instincts and sit when you need to. Nothing is life altering in the difference of a day or two. You are certainly correct and I always follow my instincts. We're in no hurry and will make it when we make it. On time would be nice but not necessary. Making it safe and sound and in one piece is the important part! Hope you, Bill and Clemson stay warm and dry!! !